Port congestion is a heavy burden international trade has to deal with. Delays and loss of time add unnecessary costs and inefficiencies to the supply chain. As a consequence such detrimental conditions, act as a trade barrier for the countries or regions involved. Such condition is more critical in developing countries where constraints budget and operational capacity is limited, depending further the problematic. Research on congestion, specifically on queue formations, allows researchers to understand better each specific scenario and to formulate solutions for the improvement of congested locations. The specific case of Colombia in South America is not an exception to the abovementioned situation. High trade volumes have been handled in this country over the last decade, increasing the traffic of vessels in and out of the ports. The particular cases of the three most important ports on the Colombian Caribbean coast Santa Marta, Barranquilla and Cartagena, are not an exception to the traffic condition. 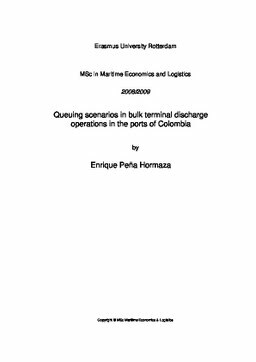 In some of the cases, high congestion scenarios occur, resulting on vessels queuing awaiting to be served by the ports. Time loss resulting from the queueing scenarios undermines the country’s capacity to become more competitive and efficient. This condition must be changed in order to improve its trade comparative advantage with respect to its neighbors. This research is focused on the analysis specific to congestion and queuing patterns at the abovementioned ports, specifically on the discharge of agricultural grain product bulk carriers. Such vessels are handled under specific operational conditions and berthing patterns at those ports, creating a unique scheme which is worth analyzing. The research is based on a model simulating different scenarios for each port, based on real cargo volume and vessel arrival data for the year 2008. The simulations allow understanding the operational constraints each port has at berth. Furthermore, an M/M/2 queuing model is used to test the scenarios in order to identify any problematic and reinforce the findings obtained from the operational analysis results. The study demonstrates that congestion is in fact a problem at some of the ports and that the most critical conditions occur when peaks in cargo volume are present. Such seasonal peaks in volume cannot be handled appropriately by some of the terminals, deepening the congestion situation further by increasing queue lengths and queuing times. On a final stage, a short term solution designed to reduce the impact of queues on ports and vessels is presented and tested. The solution in mention is based on the usage of barge convoys which are sent and positioned alongside the vessels queueing. Such maneuver is to be used to discharge partial lots of cargo on a ship-to-barge operation. By applying such alternative, queueing vessels are allowed to reduce time at port; therefore improving the flow of vessels in and out of the ports and reducing vessel delay times at port.